Home /Blog/What the experts say: Should you buy a condo? What the experts say: Should you buy a condo? Should you buy a condo? Ask the pros and many will say yes. That’s because a condo offers the layout and livability of a single-family home with the low-maintenance lifestyle of an apartment. That means you don’t have to worry about hassles like mowing, snow removal or replacing the roof. What’s more, the building may offer amenities like an on-site fitness center or pool. Other perks can include a doorman, clubhouse or concierge service. But condos aren’t for everyone. There are some drawbacks and risks involved. You need to investigate carefully before buying a condo. It pays to shop at various price points and consider different neighborhoods, too. Condo rules can govern the pets you have, how you do your laundry, your garden, even when and where you wash your car. Curious what the top financial gurus think about condos? Read on for insights. Ramsey says there are two big areas to consider before buying a condo. One is the condition of the neighborhood. The other is how well the condo association is managed. A poorly-maintained property is a red flag. So is a large ratio of rentals versus owner-occupied units. 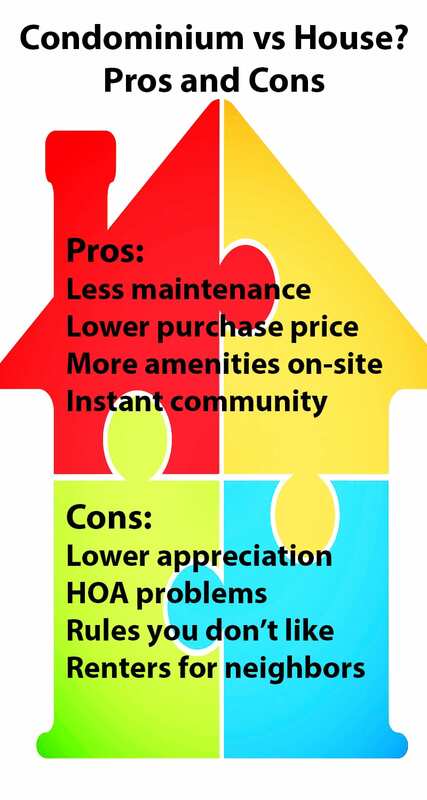 Both of these problems can prevent the complex from getting financing. Ask questions of the management company and/or Realtor involved. If you buy your condo with a mainstream mortgage, the lender will investigate many of these issues, because it wants to minimize your default risk. But ask yourself questions, too. Orman suggests meeting certain criteria before buying. One is being able to afford the HOA fees. Another is that at least 90 percent of the units must be owner-occupied. A minimum of 10 percent of the HOA’s annual budget should be put into a reserve fund. The yearly increase in the monthly maintenance fee should not have risen above the general rate of inflation (3 percent) in recent years, either. The building’s major mechanicals and roof should be newer as well. “If a development requires big upgrades, you could face a costly ‘special assessment’ charge after moving in,” she warns. Should you buy a condo? HGTV Income Property host Scott McGillivray was interviewed about this for a blog. Still, he believes that condos make for great starter homes. And you can often purchase them for less than a comparably-sized detached home. She said you have to brace yourself for maintenance fee sticker shock. The ratio of owners versus renters in the building is a big deal. Lastly, prepare to forfeit some comforts or savings if you desire a hip urban location. Consumer expert and host of his self-titled show, Clark Howard likes condos. For proof, consider his first real estate buy: It was a foreclosure condo bought 41 years ago. “I still own it and it’s been a very profitable rental property for me over time,” he said on his website. But should you buy a condo in today’s market? Recently, Howard has soured a bit on this type of home. He believes the condo market is in high-risk, high-reward mode lately. Should you buy a condo, plan to keep it for the long haul. Should you buy a condo? That depends. Condos are a different type of property than detached homes. They have their pluses and minuses. But so long as you complete your due diligence, you shouldn’t regret a condo purchase. Gather the facts and consult with experts of your own. These include your trusted real estate agent, chosen lender, and property attorney. Talk to residents in the building, too. And determine your life goals. A condo could be your perfect home for the foreseeable future.